Soon, you will decide the fate of the future EU Fisheries Control System. 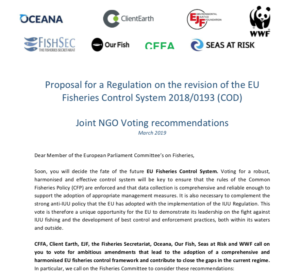 Voting for a robust, harmonised and effective control system will be key to ensure that the rules of the Common Fisheries Policy (CFP) are enforced and that data collection is comprehensive and reliable enough to support the adoption of appropriate management measures. It is also necessary to complement the strong anti-IUU policy that the EU has adopted with the implementation of the IUU Regulation. This vote is therefore a unique opportunity for the EU to demonstrate its leadership on the fight against IUU fishing and the development of best control and enforcement practices, both within its waters and outside. Establish a comprehensive system to monitor all vessels, including small-scale ones, and ensure the electronic reporting of all catches. Small-scale vessels under 12 meters currently do not have a vessel monitoring system on board and do not always have to report their catches. Cost-efficient tracking devices should be installed on board of these vessels and their masters should be required to complete an electronic fishing logbook with information on their catches. In addition, there are gaps in the current control monitoring and reporting system for larger vessels which should be closed as well. We therefore ask you to SUPPORT AMs 281, 295, 298−300, 302, 306, 331, 340, 341, 376, 628; and REJECT AMs 66, 180, 181, 198−200, 205, 206, 211, 215, 271, 276, 277, 279, 280, 282, 285, 313−317, 319, 361, 362, 364, 375, 379, 380, 381, 431−434, 437−439, 446. Ensure the proper control of the landing obligation and the bycatch of sensitive species through the mandatory installation of Remote Electronic Monitoring (REM) on board fishing vessels and the full documentation of all catches and discards. REM tools, including CCTV cameras, are the most effective tools to improve catch reporting and control compliance with the landing obligation and nature legislation, which are critical to prevent overfishing, and improve scientific data and fisheries management. We therefore ask you to SUPPORT AMs 460-462, 701 and REJECT AMs 8, 79, 80, 186, 187, 447−453, 463, 464, 466-468, 479, 800. Improve traceability requirements. It is essential that sufficient information (including IMO number, catching method and a clear link between catch area and catch dates) is passed along the supply chain to ascertain the legality of imported seafood products. In addition, to avoid jeopardising traceability rules, we also strongly oppose allowing 5 kilos or more of fish to be sold directly to consumers. We therefore ask you to SUPPORT AMs 99, 100, 272, 587, 620; and REJECT AMs 569, 571, 577, 578, 580-583, 588−606, 663−666. Ensure the effective monitoring and control of fleet capacity. It is essential to better monitor and control fishing capacity in order to guarantee that there is no overcapacity of the EU fleet. Fishing capacity is measured in terms of tonnage (GT) and power of the engines (kW). However, this is currently not being controlled. To that end, the Commission’s proposal to have continuous monitoring of the engine power must be supported. We therefore ask you to REJECT AMs 95, 495, 498. Improve the control of recreational fisheries. Adopting a registration or licencing system for recreational fishers and collect data on their catches is an essential step to move towards the sustainable management of fisheries, especially for those species and stocks subject to a recovery plan. Recent scientific studies have estimated that marine recreational fishing represents a big percentage of the total catches (up to 72%, depending on the stock and the region). We therefore ask you to SUPPORT AMs 97, 534−536, 538, 548, 551, 566; and REJECT AMs 224, 225, 529−531, 537, 540, 542−545. Strengthen the EFCA mandate and improve data quality, management and sharing among Member States, Commission and EFCA. The Commission and EFCA do not have access to data on a continuous basis. The Commission receives relevant data from the Member States, however it does not have the power to analyse it without requesting an authorisation from the relevant Member State. EFCA receives information from Member States on the fleets engaged in the regions covered by Joint Deployment Plans, but not on a structural basis. In 2017, the European Court of Auditors also found that Member States do not sufficiently share and trace information concerning the activities of EU- flagged vessels operating in the waters of another Member State. To solve these issues, in the revised Control Regulation, there should be equal and real-time access to data provided by Member States on fishing activities as well as on control efforts to both the Commission and EFCA. Member States, the Commission and EFCA should have access to the data in a non-aggregated form. We therefore ask you to SUPPORT AMs 58, 75, 96, 108, 109, 146, 158, 312, 428, 482, 483, 807−810; and REJECT AMs 32, 82, 85, 86, 90, 154−157, 247, 423. Increase transparency and make crucial information on control efforts public. Transparency is essential to assess if the Control Regulation is effectively implemented across the EU. As was the case before 2009, there should be annual updates by the Commission on the implementation of the enforcement provisions of the Control Regulation in every Member States. In addition, the transparency regime of the Control Regulation must be aligned with the general one contained in the Aarhus Regulations on access to information regarding environmental matters. We therefore ask you to SUPPORT AMs 148, 785, 805, 814−816; and REJECT AMs 34, 145, 246. Adapt the general control framework to the control of technical measures. The Control Regulation must be adapted to enforce more precisely the rules on technical measures for the conservation of fishery resources and the protection of marine ecosystems. We therefore ask you to SUPPORT AMs 254, 332, 680, 789, 790. Effectively control fishing restricted and marine protected areas. The development of new technologies has made it easier and more cost-effective to monitor and control the activities of fishing vessels in fishing restricted and marine protected areas. This should be reflected in the revised Control Regulation. We therefore ask you to SUPPORT AMs 97, 522; and REJECT AMs 520, 521. Support the creation of an EU database for catch certificates to strengthen the EU IUU Regulation. Electronic catch certificates as well as the introduction of an EU-wide IT system for their processing will provide a decisive mean to improve seafood import controls and verifications and harmonise these practices among Member States, as well as bring added transparency into supply chains in a cost, labour and time-effective manner. This tool should be mandatory for Member States to use. We therefore ask you to SUPPORT AM 163.